A few examples to try out..
You make such lovely textures. I will credit when I use them. these are sooo pretty. i've downloaded it. they're too pretty. maybe i'll just stare at them and not using them. Snagged the set. Will credit if used. 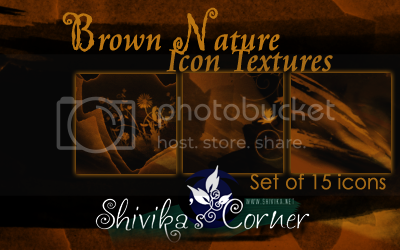 u most welcome.. really.. cool.. just started watching hawaii o five.. and feel in love with this character.. i am getting some icons ready for that.. so check out my journal soon..
Downloading this set, since I really liked the last set of textures that I got from you! Thanks! Snagged. Will credit where used! I was searching for brown textures and found these, perfect for what I wanted. Simply beautiful textures.